A virtuoso display from Dan Evans against his former side saw Ospreys come from behind to beat Dragons 29-20. Evans scored four tries, earning a bonus point on his own as Ospreys avenged their defeat at Rodney Parade in the reverse fixture. The Dragons, who lost Tyler Morgan to an injured arm, had led 17-10 at the break as they threatened to pull off an almighty shock at the Liberty Stadium. But Evans' display allowed Ospreys to edge ahead after half time. Evans became only the second Ospreys player, after Tommy Bowe, to score four tries in a match and the first to do so in the league. 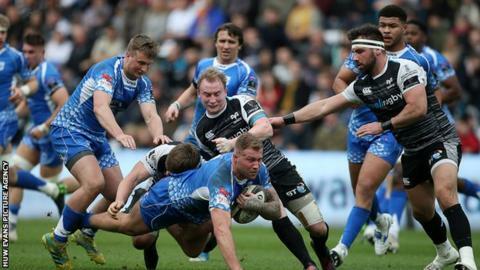 It has again been a tough season for the Dragons, who sacked coach Bernard Jackman halfway through the season, but they were bidding for a double over the Ospreys. The last time they won at the Liberty Stadium was 2010 and their last away win in the league was back in March 2015. The Dragons knew it would be a tough task to end that run as Ospreys named five Wales Grand Slam winners. It was the hosts who made the faster start, with Justin Tipuric's early score ruled out for a forward pass, before Olly Cracknell's slick handling allowed Evans to cross for his first try, with Luke Price adding the extras to put the hosts 7-0 ahead. Ospreys were pushing for a second try, but were caught out when Rhodri Williams intercepted a pass and ran the length of the pitch to score brilliantly. Jason Tovey added the extras. Tovey then nailed a penalty to move past the 1,000 point mark in his career, before Hallam Amos intercepted a loose pass and burst forward to put the Dragons into a shock lead. Their momentum was stymied when Morgan was forced off with a shoulder injury, with Price reducing the arrears with a penalty on the stroke of half-time. A kick from Keelan Giles puts the Ospreys on the attack instantly in the second period and their move culminated in Evans crashing over again. A Tovey penalty extended the Dragons lead to 20-15, but Evans again found too much space to compete a hat-trick of tries, with the conversion putting the hosts ahead. Evans then completed an incredible individual performance with his fourth try of the game, ensuring his side a bonus point. "It's just about being in the right place at the right time, all the hard work was done for me and I benefitted. "It's a good achievement to have (equalling Bowe's feat), but Shane's quite a bit ahead in the all-time list. It's a lot of hard work and hopefully there's a few more in me to come. "It was an important victory for us with all the negativity that's happened (over the Ospreys' future) around us, it's nice to go out and put a bit of a statement on. "Even though it's tough times, we've stuck together and the Wales boys coming back on cloud nine after the Grand Slam has picked us up a lot." "It was probably about discipline, at the start of the second half we gave them penalties, they kicked to the corner and scored two tries and we couldn't get back into the game. "We put ourselves in a winning position and let it slip again, Dan's a quality player, we knew that when he left (the Dragons), he's been scoring tries down here for years and playing well every week. "(The thousand points mark) was probably eight games too late but I got there in the end, individually it's nice but it would have been nicer to get there on a winning side. "I'm just (contracted) to the end of the season and we'll see what happens." Ospreys: Dan Evans; Hanno Dirksen, Cory Allen, Owen Watkin, Keelan Giles; Luke Price, Aled Davies; Nicky Smith, Scott Baldwin, Tom Botha, Adam Beard, Bradley Davies, Olly Cracknell, Justin Tipuric (capt), James King. Replacements: Scott Otten, Jordan Lay, Ma'afu Fia, Lloyd Ashley, Sam Cross, Matthew Aubrey, Sam Davies, Luke Morgan. Dragons: Jordan Williams, Jared Rosser, Tyler Morgan, Jarryd Sage, Hallam Amos, Jason Tovey, Rhodri Williams; Brok Harris, Richard Hibbard (capt), Leon Brown, Max Williams, Matthew Screech, Aaron Wainwright, Taine Basham, Ross Moriarty.